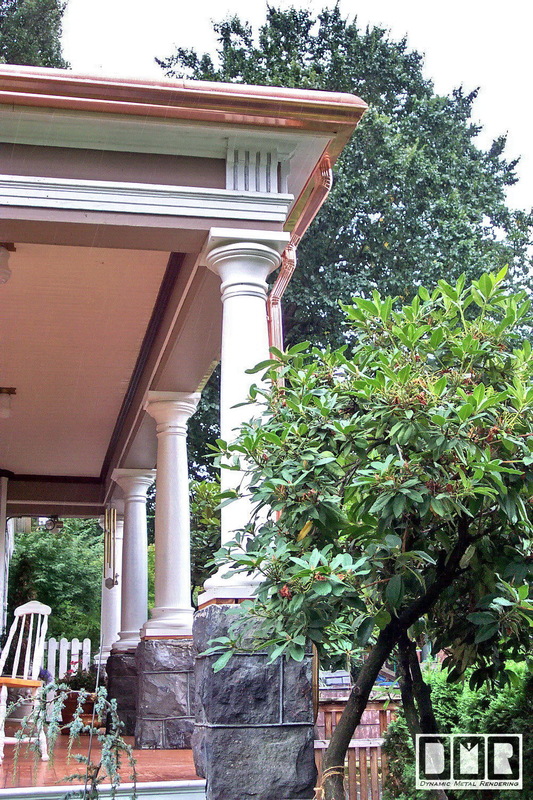 If you are a Homeowner here in the Great Northwest who suffer substantial problems with tree fall-out you are familiar with how frequently your gutters back up and need servicing, and have caused you a good deal of stress. There is not anything in house maintenance that causes such frequent stress than rain gutter function, or lack there of. Truthfully there is no perfectly trouble free solution, but I have figured out a specific 3 part alteration that works best: a large hole screen over the gutters, 2X larger outlets, with a strainer opening in the downspout where the Homeowner can access it w/o a ladder. 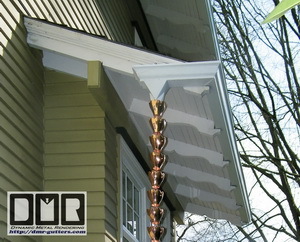 No gutter cover alone will work long term. 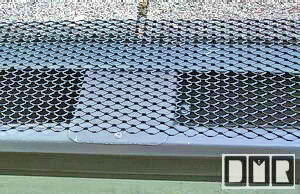 If it is a small hole screen to keep out all the debris it will get clogged in short order and not let rain water pass. If they are just pushing one part of this they are missing the mark. Here is one of my gutter jobs from the late 90's after about 8 years of no service at all; with a blanket of moss in the gutter 3" thick. He was asking how much I would charge to clean out his gutters. Forgetting I offered him a 15 year no-clog warranty. He figured it was time they got cleaned out, even though they were still working fine. I happily cleaned them out at no cost and added this photo here to my web site to show what can happen if you are truly able to leave your gutters alone for this length of time. My no-clog gutters are half the cost of Leafguard. 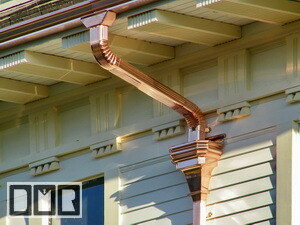 Heck, my copper gutter bids are usually even less $. Although, I am booked out over a year, so I turn away more clients than I could take on, since most people do not want to wait that long, so they get the same crappy set of gutters, like what they had, and I have me replace them after figuring out they are no better. The main question is; can you trust these debris filtering devices truly work as claimed. Most don't continue to work long term, and are far too expensive to be practical, so why should you spend the extra money for low maintenance options that don't last? Read below for some logical reasons to consider practical solutions at a more reasonable cost. 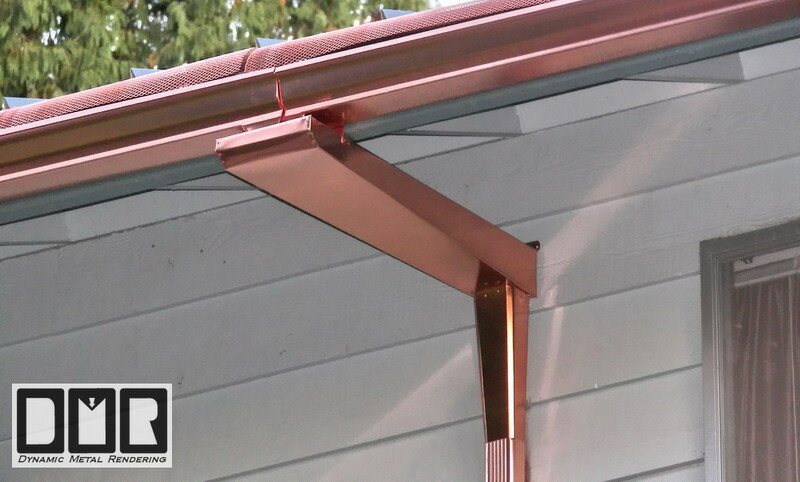 I have developed a 5 piece system that looks like this for a low maintenance package for the rain gutters on your home (does not have to be copper, as shown here), which will allow for continued functionality. Just covers over your gutters alone are simply not enough, so any business suggesting that's all you need has already lied to you, given they know this does not work. If a cover can do that it will also keep out the rainwater from entering your gutters before long. Just like the strainer in your sink. Keep in mind window screen is far to fine of a weave to work, so any salesman peddling that junk is a scam artist. 1. Rust free gutters that are graded with a slight slope towards the outlets, so there is no standing water in the gutters and will be rinsed out in a heavy down pour. Therefore less trapped debris in your gutters. Hung with stainless steel screws, so they can be readjusted if the house happens to settle; allowing you to alter the original installation. 2. 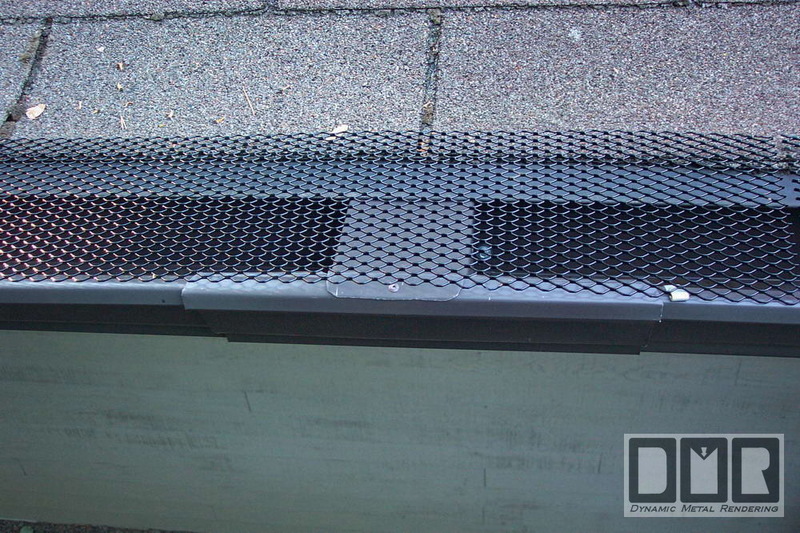 Screens with bold large holes just to keep out the larger debris that clog gutters quickly. Such as braches, pine cones, toys, most leaves. I do not claim this will keep out all the debris. 3. No screen below a roof valley. I have learned there is no type of screen that can be used below a valley or drain pipe from an upper gutter, so I have to allow any debris from those problem areas to go into the gutter or stopped up on the roof. There is no solution I've seen that will work in these areas. 4. No matter what kind of gutter covers you have you will still have lots of moss growth form in your gutters, so larger outlets are essential to a functional rain management system, and the screens need to be removable without tools. If the outlet is the same small size it would not matter how big your gutter is. You could have a gutter as large as a bathtub, but it would not help with this issue. That small debris which will get through the screens as well as this moss build-up inside the gutters can still flush out in a heavy down pour if the outlet is much larger to make the transition down into your downspouts. 5. An easy access strainer. Of course you don't want all that debris clogging up your underground storm drain pipes. 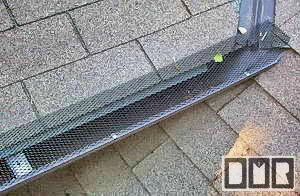 The Leaf-catchers we make is a strainer with a 6X6 stainless steel screen in it placed down low in the downspouts where it can be easily accessedwithout a ladder or tools, so you will not have to get up on the roof to unclog your gutters in the worst of weather when you always realize there's a problem. 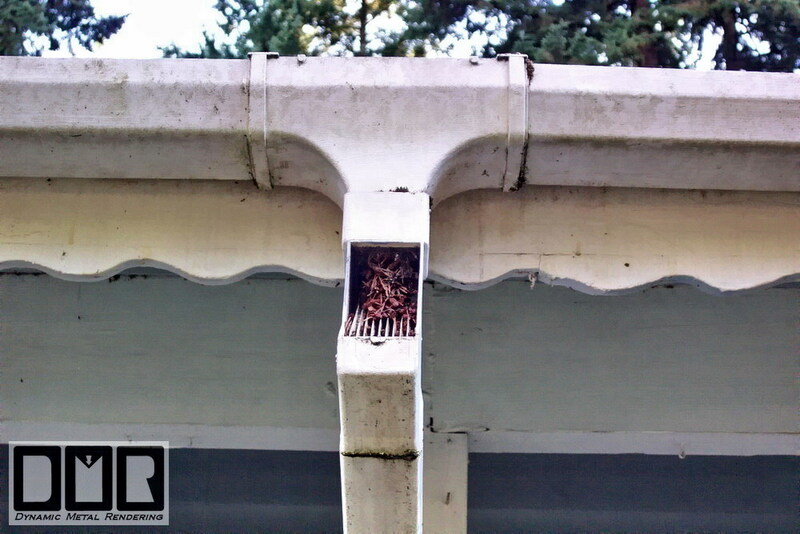 A strainer up inside your gutters is the opposite of a larger outlet and cause a gutter failure that much sooner. Placing the strainer down where you can reach it is a great deal more user-friendly and less expensive than one visit by Roto-Rooter. (a) Time & Money: There is the obvious advantage of savings you'll get for adding a low maintenance rain management system, which won't need the regular service of standard gutters you're familiar with. That is if these options are not too expensive of course. 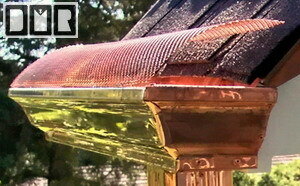 I do not believe a gutter cover should cost more than a new aluminum gutter no matter how well they claim it works. Even if you do not clean out the smelly disgusting debris yourself; the time you save finding someone you can trust and rely on to come out and service your gutters a couple times a year. Then to watch over them to make sure they don't cause more damage than they're helping with. That should be well worth the extra cost alone, but many people cannot seem to justify this cost for that issue alone. (b) Damage: I feel the best reason is the savings from premature roofing, painting, and gutter repair from all that extra traffic up there to your roof line in order to clean out the gutters so frequently, year after year. At best they'll only leave lots of dirty marks and scratches on your house paint when they lean their ladders on the siding or pressed against your gutters in order to access your gutters to clean them out. 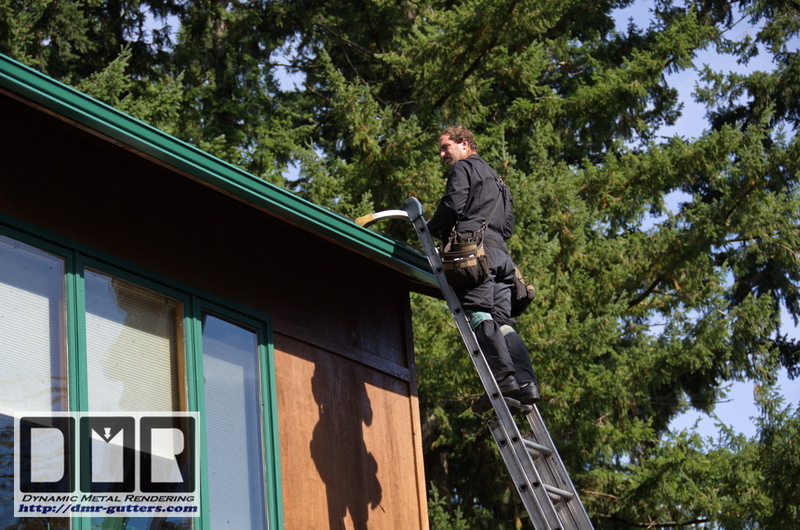 Banging ladders against your gutters several hundred times a decade will cause not only unsightly scratches, but lots of dents in the outer edges of the gutters, since even most professionals will not use the padded ladder stabilizer I do. If you have a low slope roof most will clean the gutters from on top of your roof instead, but that's not much better, since the extra traffic on your roof will shorten the life of your roof bit by bit. Especially if you have a metal roof. These issues can cost you much more than the most expensive gutter leaf-protection products out there and make the house looking beaten up over time. Clearly, the less need to access your roof the better. 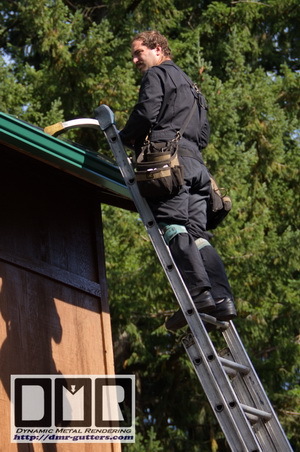 (c) Safety: this issue with whom ever will be going up and down those ladders several hundred times a decade to clean out your gutters is substantial, since one accident would most likely cost more that these sort of options that should minimize the need to access your roof. 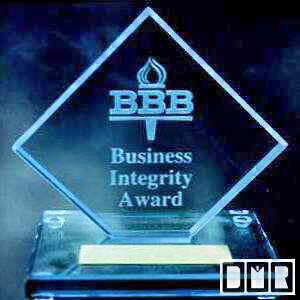 (d) My Extensive Research: with my passion for ethics, honesty, and integrity (as represented by the Business Integrity Award I got from the BBB), I pride myself on presenting you with a clear and unbiased evaluation of the effectiveness of the different leaf protection products out there against their cost. In an effort to help you from wasting time and money on a product that may seem like a great idea, but will not work long-term as claimed. There are several concepts sold that seem very clever, but found they will only work in a debris-free situation. Which make them completely pointless. I've done my best to search the world over for the most cost efficient solutions to these problems. Below is what I have come up with so far. 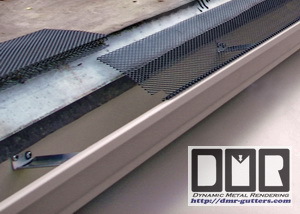 I have yet to find a better solution to the debris plaguing gutter function than these products regardless of cost. But I'm always open to suggestions, so feel free to go to our 'Contact' web page and write to me about any ideas or other products I may not have had the chance to concider. If you want to learn more about my research I've written another web page going over the comparisons and long-term functional details of the most well known debris protection options out there. Go to my 'Comparison' Page and read over these options in more detail. I calculate these low maintenance options itemized on each bid with no pressure to take all or nothing. I would say less than 20% of our clients in the last decade had us install gutters without those options, since natural tree fall-out is such a huge issue here in the Northwest. Even though I am just a small Gutter Contractor I've personally serviced over 2,000 houses with gutter replacements since 1992, so you see I do have a sizable amount of research information gathered to form my evaluations here. Again, we are open to your input. Above left is an actual aluminum LEAFGUARD® gutter cross section profile that I have to show clients the clear difference. The right image shows a more user-friendly and much less expensive leaf screen over my exclusive 20oz copper K-5 gutter for about the same cost. which would you rather have? The screen has around 10X more area for the rainwater to find it's way into the gutter. It is important that this continues to allow some 95% of the water run-off to be caught by the gutter with minimal maintenance, or it is a flawed product. 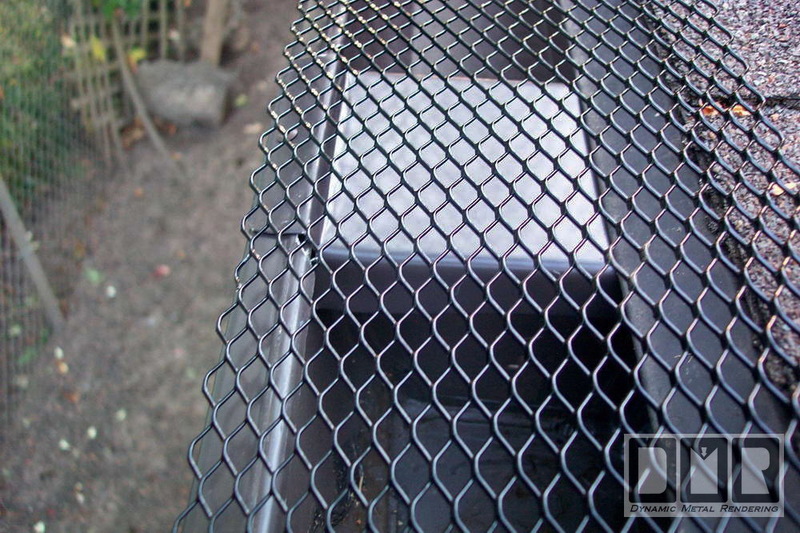 The worst example is a company called Leaf Filter or Gutter Glove who was stupid enough to make a gutter cover that uses a stainless steel screen over a plastic or aluminum grid, which has a finer weave than a tea strainer, so it fails to allow water to pass through with just a little dust or mildew build-up blocking those tiny pours. I have some of it off a client's house I had removed after only 2 years of service to show people . It worked OK for the first year, until the warranty lapsed. Now that's planned obsolescence! The worst part was how it had cost them more than my complete new aluminum gutter replacement w/screens, larger outlets with, Leaf-catchers. Would you say they were ripped off? I've seen how even window screen has holes that are too small to be practical, and cause more problems than it helps, so that product was sheer insanity. Note: LeafGuard® is a registered trademarks. We have no connection to their company or franchise. 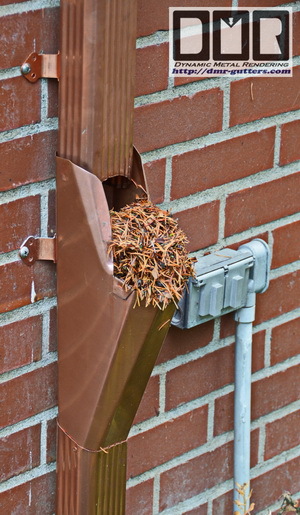 These wont keep pine needles out of my gutters! This is why it is so important to have larger outlets, which LeafGuard® also hinges their warranty on. 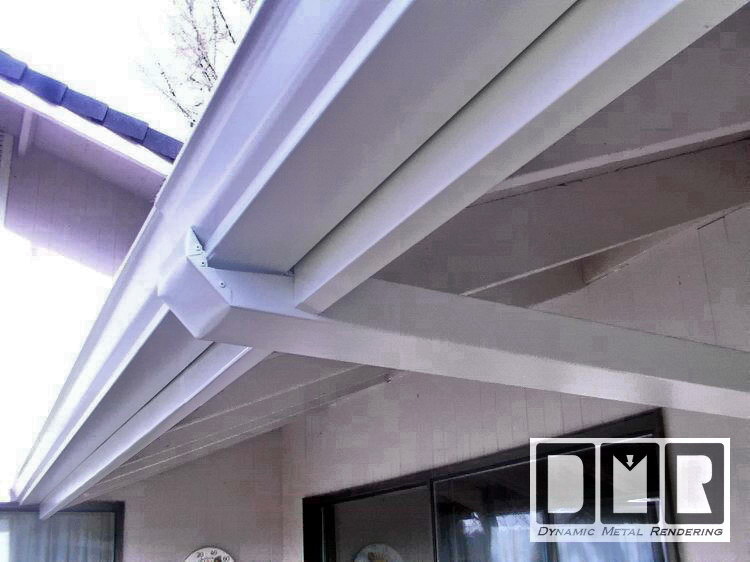 Many ask if they need a larger gutter. I remind them how if the outlet is still the same small size it will jam and fail just as quickly no matter how big the gutter is, so that would not make much difference. I have removed gutters from thousands of houses in the Portland, OR metro area, yet I had never seen this sort of moss buildup before. These gutters I had installed 7 years prior were still draining. This demonstrates how this client Stuart Surcamp in Millwaukie was truly able to leave his gutters alone since I had installed them. He happen to see my rig driving around and called my cell# to ask how much I would charge to clean his gutters. I reminded him it wouldn't cost anything if they've failed to drain properly. He said they were still working fine, but imagined it was time to have them cleaned. I still cleaned them out for free and took this photo to show what can happen. Our clients report that with just the screens alone they find the need to clear out their gutters about 1/4th as often. The main benefit is how these will keep out the large debris that clog up the gutters quickly: most leaves, pine cones, branches, and toys or bottle rockets. A screen with a smaller weave like window screen is too fine and will cause the rain water to cascade over the screen out past the edge of the gutter before long. Especially at the bottom of a valley. I have learned even this screen is not usable below a valley or drain from an upper gutter. 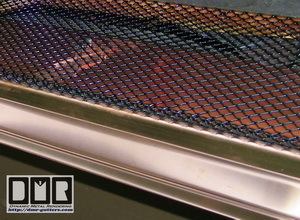 To the right is a close-up photo of the type of powder bake steel leaf screens I've used since 1998 for use with aluminum and copper gutters with one of the screens shown about to be installed. Copper screens: are 3X the cost and not very strong. Some time before 2008 they started making these screens with even thinner copper to help keep costs down back when copper had doubled in cost. 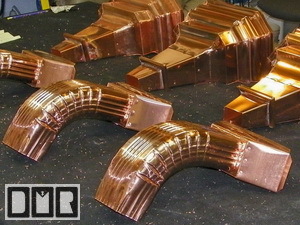 My copper clients are expecting better than standard. Not less than standard quality and sturdiness. 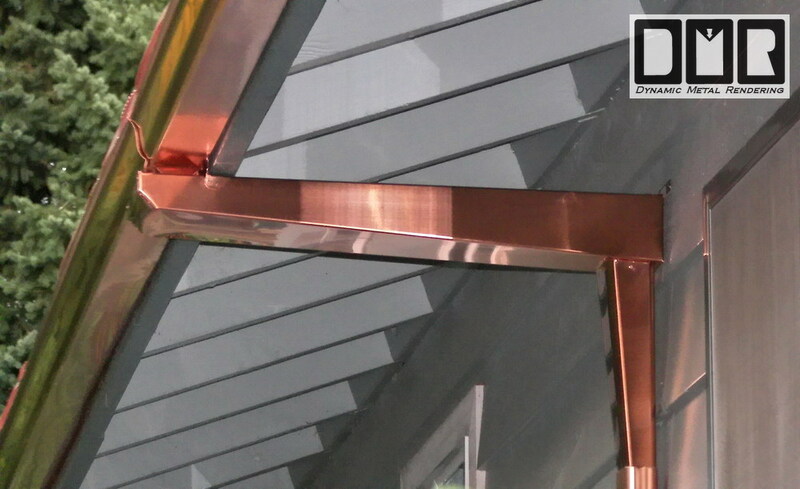 Copper gutter screens will end up getting bent out of shape and even dislodged from the gutter within the same time as stronger steel screens would rust, so they're hardly worth the $. Even though I can still get copper screens for clients getting copper gutters they have wisely opted for the more practical steel screens. I am still looking for a supplier for better copper screens or stainless steel screen to use, but so far they want way too much even w/o attachment hardware. Stainless steel: would work, but they are more expensive than these copper screens, so it is to pricy for aluminum, or even copper gutters. Aluminum screens: are too fragile and light weight, so they simply will not work. They get blown off in a wind storm, or cave into the gutter from piles of debris on them. 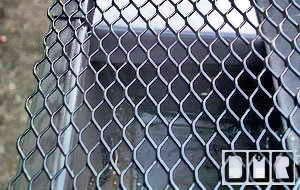 Steel screens: I use these, since they are a strong product at a reasonable cost. They have a good black powder-bake coating on the expanded metal. Personally I hate steel, but screens do not have to hold water like a gutter does, so rust is much less an issue. This is the best products I have found at a reasonable cost. These photos below also show the way we seal the end of a gutter at the base of a valley to catch that water, instead of cutting the bottom of the gutter open there to dump that gunk on the roofing, causing a mossy trail and wearing the shingles from that river of water running down the roof. 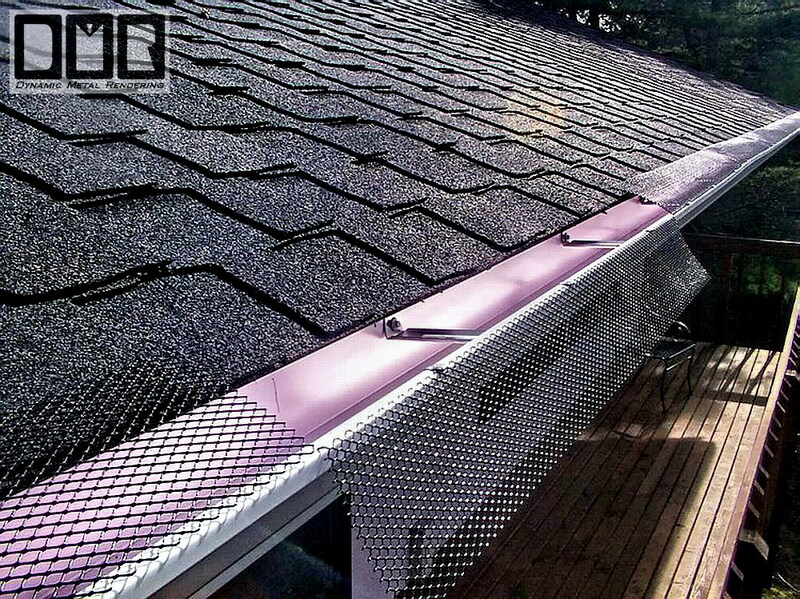 They are made with a sturdy steel metal that will not cave into the gutter or get bent out of shape so easily. They are heavier, so they are much less likely to blow off in wind storm. 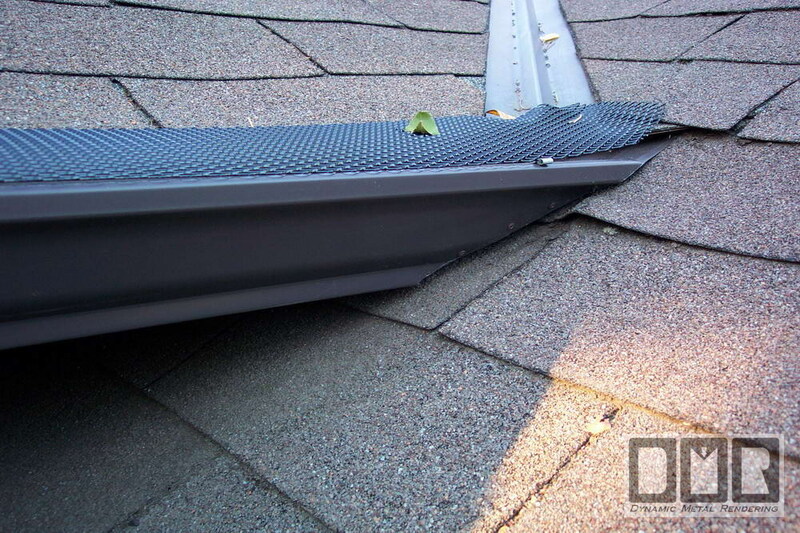 They are angled, so leaves and other debris will blow off the roof more readily, instead of piling up over the gutter covers, just to decompose and turn to mud; not letting rain water pass through the gutter screen and starting to grow plants over your gutters. Which is the problem with most other leaf screens or similar products I've seen. 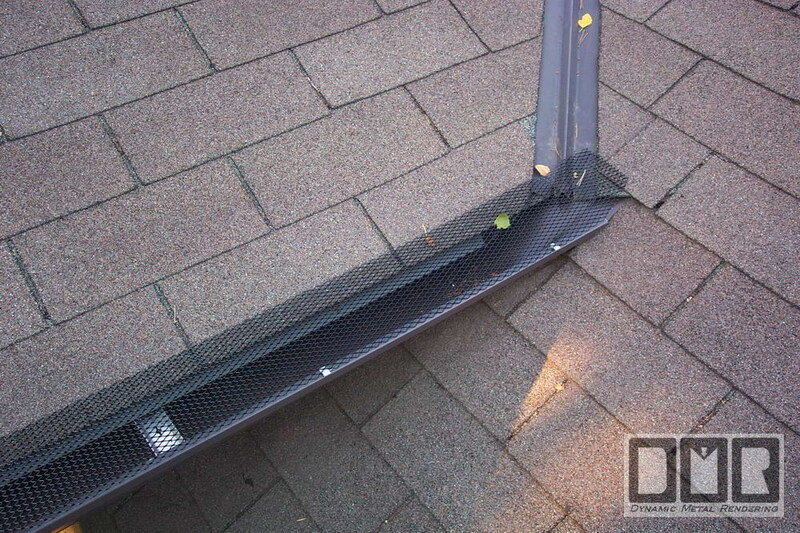 These leaf screens allow for easy visual inspection to see if there is a blockage, and allow for gutter cleaning w/o removing the leaf screens as long as you have the larger No-clog outlets and Leaf-catchers. 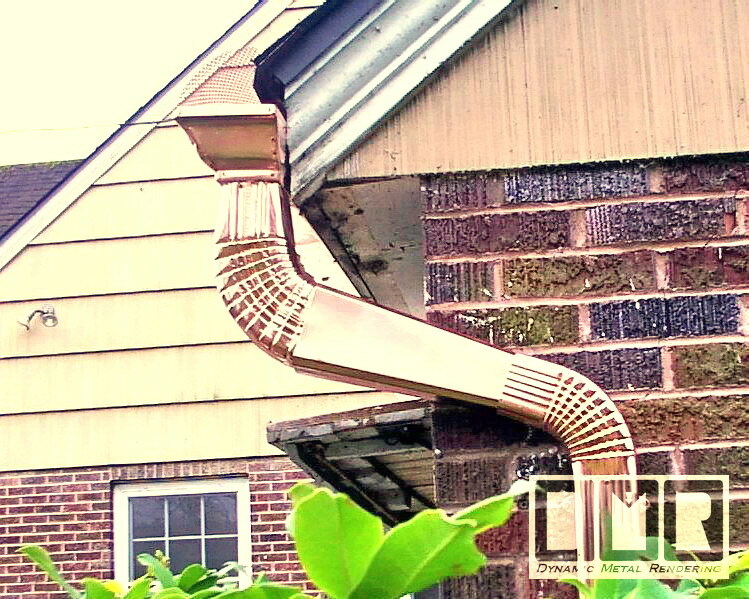 You can simply place a metal or plastic cover over the screen of the Leaf-catchers in each downspouts, then just hose them out right through the screens, flushing the debris down your downspouts, where it simply dumps out on the ground. It can then easily be scooped up from there and disposed of. With this method of cleaning the smallest debris and even roof sand can be cleaned out of your gutters without getting trapped in your underground storm drain pipes. Can you think of a better system? With these leaf screens there's over ten times more area for the rain water to find it's way into the gutter than any of the solid hood type covers sold. They have over 2X more open area than plastic screens, so they are less likely to get clogged. (simply speaking, LeafGuard® and all the other types of hooded gutter product companies may guaranty that their gutter will not clog, but they will not guaranty their gutters will continue to accept water. There in lies their clever deceptive loop hole). With our installing only these type of leaf screens is how I show I can afford to maintain my 'No-clog Warranty', since it is a lot easier to clear out the debris from under these screens (not having to replace the whole gutter to solve the problem, like with the LeafGuard® system). These screens will still keep out a good 90% of debris we have here in the Northwest: branches, pine cones, most leaves, toys, and much of the pine needles that will jam up your gutters quickly. We do not try to claim they will keep out all debris, hence the importance of the large outlets and Leaf-catchers to handle the small debris that will get through these screens and the moss that will form inside the gutters if left alone. This is most important in the event that later on the company responsible for their warranty is unable to fulfill their obligations for what ever reason, and you are stuck with a product that is not working and impossible for you to resolve these issues. Always an important detail to consider before any purchase. These leaf screens cost far less than any of the LeafGuard® gutters type hood systems you can get or most other screen products sold. 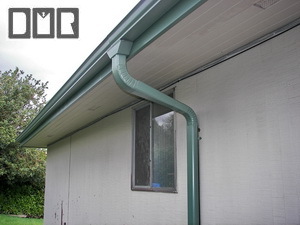 The cost is only $1.75 if you can install them yourself, or 2.50 per foot installed on houses w/o complications with a new gutter replacement, or $3 ln' for over your existing gutters w/a gutter cleaning. There are dozens of different alternative add-on hoods like the LeafGuard® system that also cost a small fortune, and we link to several of their web sites on our Site Map web page. Even if they worked as well as they claim (which they don't) all of those sort of add-on leaf protection hoods have a wholesale cost that is more expensive than our retail cost of our screens installed, and they are more difficult to install. 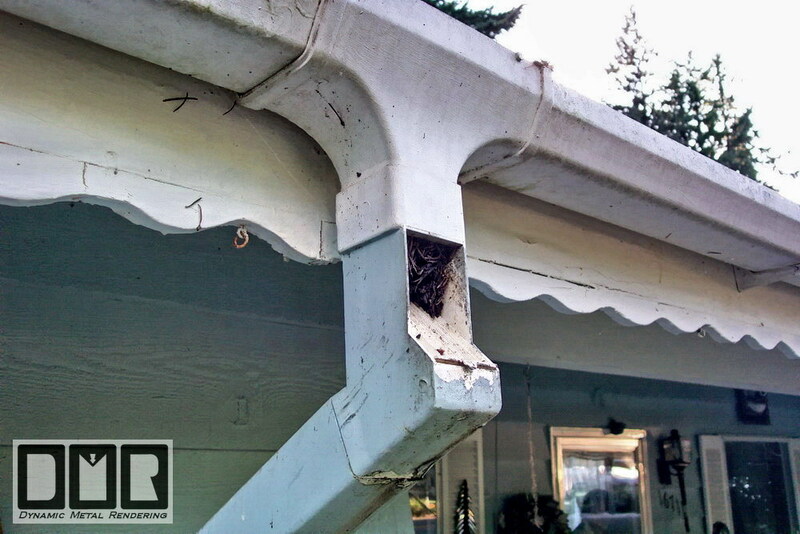 Why would you pay over 2 to 3 times the cost for those sort of hood than the cost of a new aluminum gutter? Even if they did work as they claim. 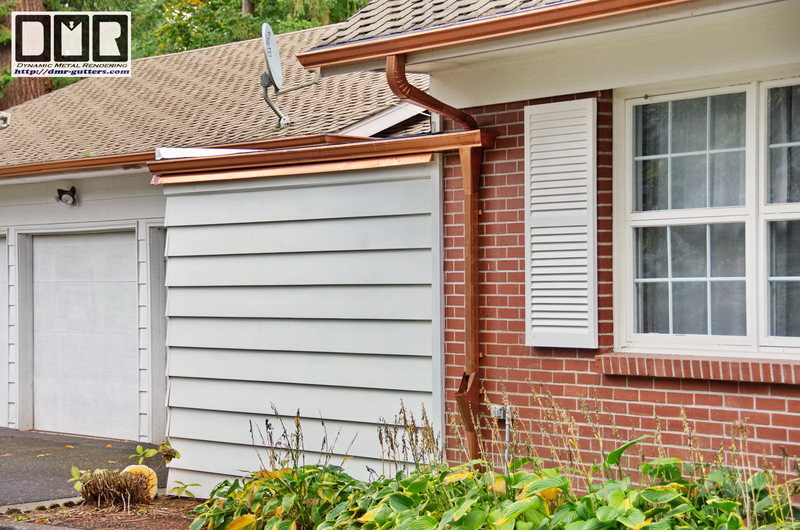 I do not believe a gutter cover should cost more than a new gutter. 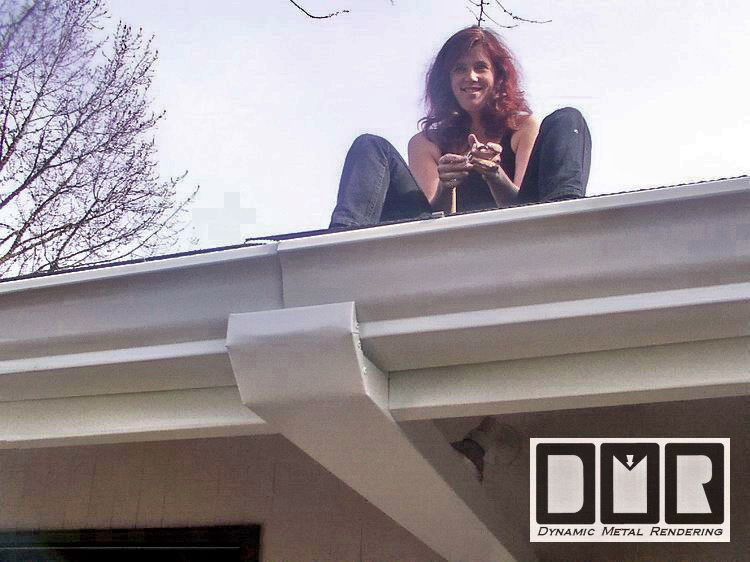 Let alone more than the cost of our aluminum gutters hung with hidden hangers and stainless steel screws. That's insane! Our leaf screens are coated with a black powder bake finish, which makes them very inconspicuous. We've had difficulty figuring out a way to photograph them to show what they are like, since they blend in so well. I have been using these for well over a decade and have yet to see them rusted out. 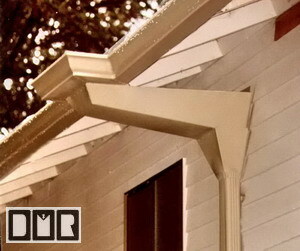 Do Gutter Hoods Really Work? 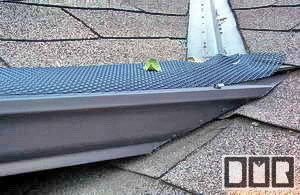 If you have no debris issues they will work swell, but of course that would mean you have NO need for a gutter cover. I've personally seen many examples where they will get jammed with debris in the small area for the water to enter the gutter and will create a waterfall situation killing your landscaping or worse. These companies are not obligated to solve this or refund your money, since the gutter did not clog, but why have gutters if they are not going to manage your roof water? 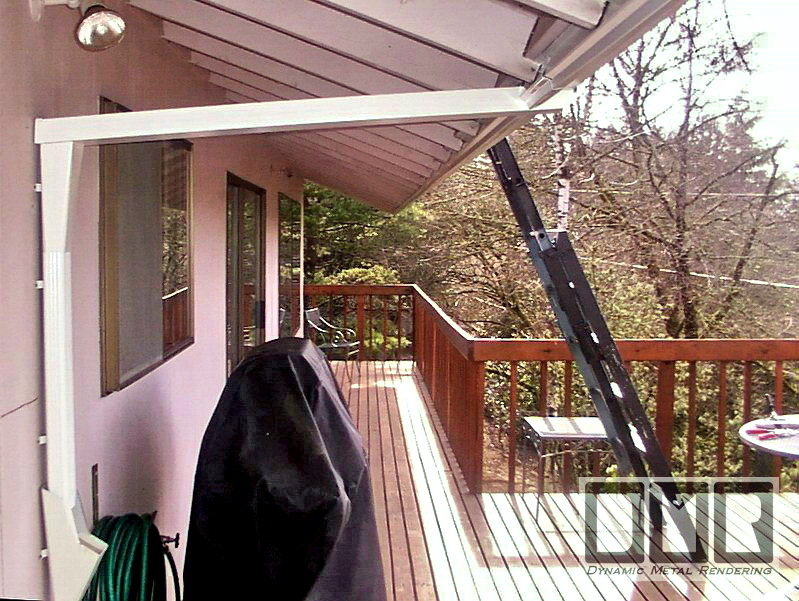 Example: We had a client named Mr. Bronson, who ordered some covers to install over his existing gutters he got from the Brookstone catalog that use the same principle as the LeafGuard® system. He had a steep roof on a two story house, so he had us install them. Within one year he called us back to hire us again to remove those gutter covers and install the hinged leaf screens that we recommend. He reported that with the other metal covers; pine needles would get stuck in the small opening, where the water is to seep in. This blockage would encourage the water to pour off the end and caused a water fall over places like his doorway (no joke). 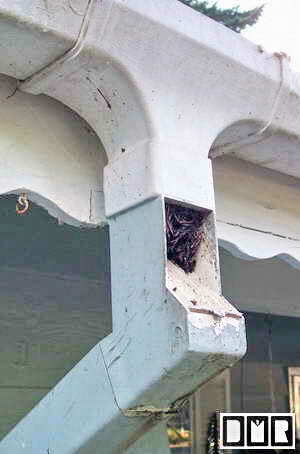 Debris will quickly get stuck in the crevice for the water to seep into the gutter. Well before it turns to mud as it decomposes, it will cause a waterfall over the edge of the gutter. As we said above, they may guaranty that the gutters will not clog, but that does not even suggest that the gutters to continue to accept the rain water. It also does not allow for inspection of the debris build-up in the gutter, let alone anyway for simple access to clean it out. We have since refused to install these sort of hoods at any price, since it clearly goes against our ethics. We will not kid you about the issue of pine needles. These screens may do well to stop about 50% to 60% of small pine needles from going into the gutters. That is why it is so important to have the large industrial size outlet along with the Leaf-catcher strainer down near the ground in the downspouts. Between this 3 part protection system, we have had very little call-back issue after installing these No-clog options on thousands of houses since 1996. There is no better product out there for these issues we've found at any price, no matter what their claim (see our comparison web page for more details). You will still have the roof sand settle in your gutters and moss will grow inside, so it is good to be able to be able to see and get in there to clear it out from time to time, but that's not required with our No-clog installation warranty. We have put these itemized options on each bid, with no pressure to take all or nothing, but only around 20% of our clients in the last 15 years have us install gutters without these options, so we have had a pretty sizable number of installations to gather this research from. On each gutter job over the last decade+ I have installed them graded to drain down towards the outlets, which helps to rinse out the gutters in a heavy down pour. I check this as I install them. There is a set of lines on the level bubble window and I have the bubble barely touching one line, as opposed to dead center between the two lines in order to set just the right grade down towards the outlets. Sadly this is very rare from what I've come to realize. Even if their slick Salesman claims they will, how do you know until it is too late? With the nail spikes they use there is no way to remove them w/o damaging the gutter to adjust the angle, so it would call for a complete replacement if you find they did not live up to their claim. Then it will be your word against his w/o any written documentation. I have yet to hear of a Homeowner getting another Gutter Contractor to install the way we do, or to get them to honor their claims. This web site and our presentation folder have all this in writing clearly spelled out. 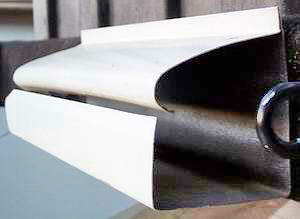 Our gutters also have a wider bottom than fascia style gutters, which allows the debris to travel sideways more easily. They are also easier to get a hand in the gutter to clear it out if needed. Also allowing for a wider outlet for less clog issues. These issues are why I cannot offer our no-clog warranty with just the addition of screens and larger outlets on existing gutter systems. It is very rare to find your gutters were installed with the proper grade needed for good functionality (but it could happen). 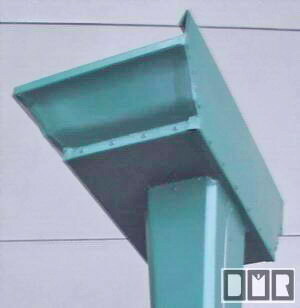 Our standard DSP (downspout pipes) are a corrugated 2" X 3" size with rounded corners. 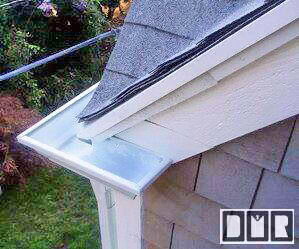 Most Gutter Contractors in this area install the smaller cheaper smooth square steel DSP, and they do not bother with the curved elbows made for them, which would help to reduce the risk of obstructions forming inside those DSP. The larger 3" X 4" DSP (shown right) were designed for industrial applications, where huge roof area surfaces are an issue. They will handle twice the volume as a standard 2" X 3" DSP, but the benefit for a house is being able to have a 2X larger outlet for the debris to be able to make the transition into the DSP better. A larger gutter with the same small outlet would not help at all. The size of the outlet makes a much greater difference by far. Making sure the gutters are sloped the right direction also helps more than a larger gutter would, but that part of a different topic. This 3X4 DSP feature is what LeafGuard® hinges there no-clog warranty on. Keep in mind how it only helps to use these 3X4 DSP for the sole reason of cutting a larger hole for the outlet in the gutter system. 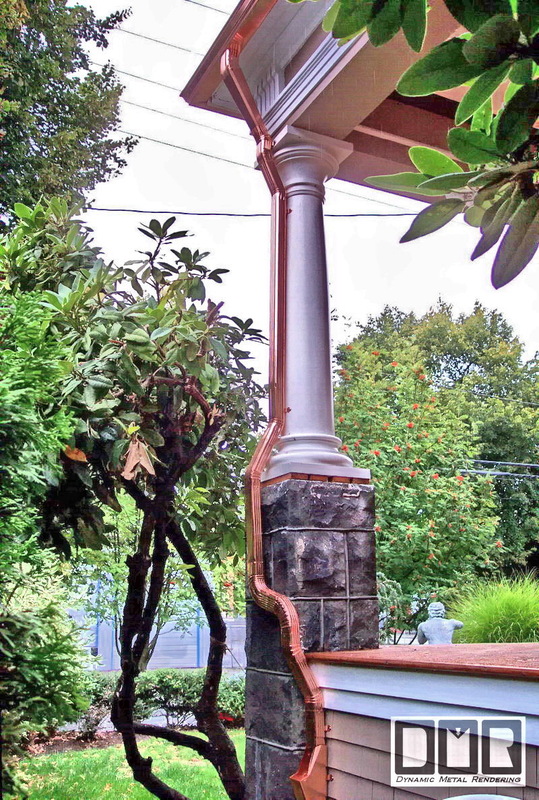 The local LeafGuard® franchise buy their downspouts from the same suppliers we do, so I decided to offer the same sort of No-clog Warranty with our gutters and leaf screens at a fraction of the cost. With these stronger leaf screens we install, they are easy to install, much less expensive, user friendly, and we can better afford to manage our warranty this way w/o having to charge you an arm-&-a-leg to defer the cost of that sort of replacement cost LeafGuard® would have to suffer when their gutter fills with moss! That alone is very telling of their product. It is not like their product is any more expensive to produce. Some of their outrageous cost is for the expensive advertising they push, but the other half demonstrates the cost of the failure rate of their product, even with all the clever loop holes they have written into their guarantee. These larger commercial size downspout allows us to cut twice the size hole in the bottom of the gutter, making it much more likely that the debris will tip into the downspout and flush through. Instead of the debris covering the outlet and creating a natural strainer in the gutter, which will decompose and turn to mud, so as to not allow rain water pass, causing the gutters to over-flow. It only makes sense that you need the gutters to continue to drain, or there is little reason to have gutter to be on your house at all. Placing a strainer up inside the gutter may help to keep your underground sewer pipes clear of this sort of debris, but they are death to gutters. That is the exact opposite of installing the 3"x 4" downspouts. Using the leaf-catchers instead (shown below) is a lot smarter, so you do not need to go up on the roof to clear out that smelly debris. 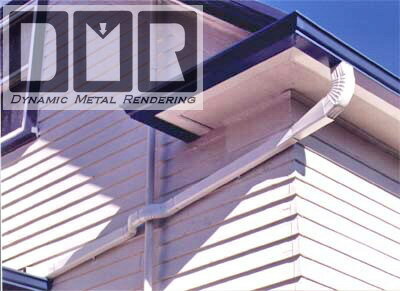 Right after we starting to offer this advantage, we would noticed our customers dissatisfaction of the look of those huge industrial size downspout coming down their siding. Even if they did not say anything about it, we could see the look on their face. LeafGuard® insists on using these double size downspouts all the way down the side of your house to the ground only so they can still charge 3X more for their over-kill DSP, like they do for the super high cost of their gutter system. They insist on those larger DSP because even though their gutter is design with only a 1/4" opening for the rain water to get in, a good amount of small debris will still wick in with the rain water, so when their gutters do get cloggedwith pine needles and moss they often have to replace the whole gutter, since there is no way to open them to clear out the blockage. That is unless it happens to be just a simple straight run, and they are able to remove the end-caps to blast out the gutter with a hose (see our comparison web page for more details). Since we are not as greedy as the LeafGuard® franchises and have a much lower overhead wecan charge less than half their price. I figured out how we could use the same reducer (that funnels the downspout to fit in the storm drainpipes) up higher on the wall. The large 3"x 4" downspout is not needed for the dead drop. It is only needed to make the larger drain hole in the bottom floor of the gutter. Our customers have clearly been more saticfied with our alternative, not to mention how it also reduces the cost dramatically. 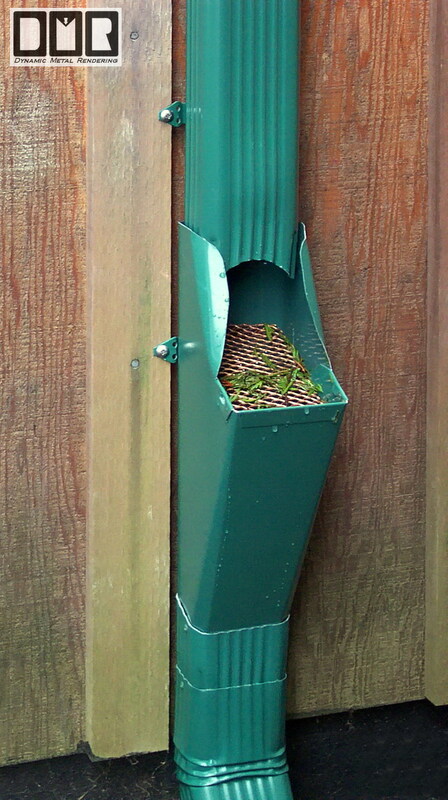 We also are able to use a smaller Leaf-catcher on each downspout as well because of this. 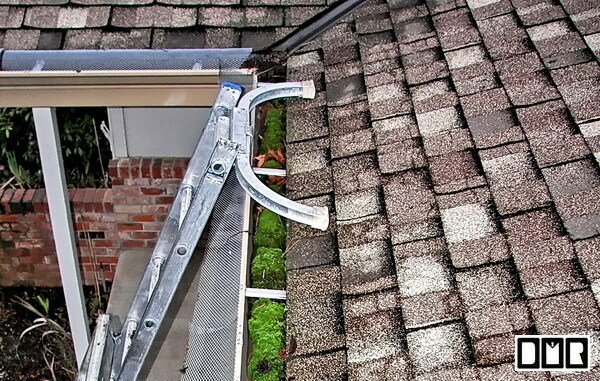 In the last 15 years of doing most of our gutter jobs this way, we have had very little call back for clogged gutters. We have had no call back for a clogged downspout. The DMR Gutters system seems to be working quite well. You can contact us for contact info of our past clients. I post addresses on this web site, but I do not want to expose them to spammers with their personal contact info here on the web. 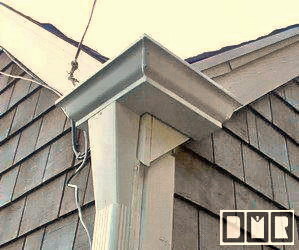 This option adds only $50 per outlet to the cost of a new aluminum gutter installation. Or $75 to alter your existing gutters to these larger outlets. We are not able to offer the same sort of No-clog Warranty with alterations of your old gutters, mainly since your old gutters would most likely not have been installed properly with a grade towards the outlets. 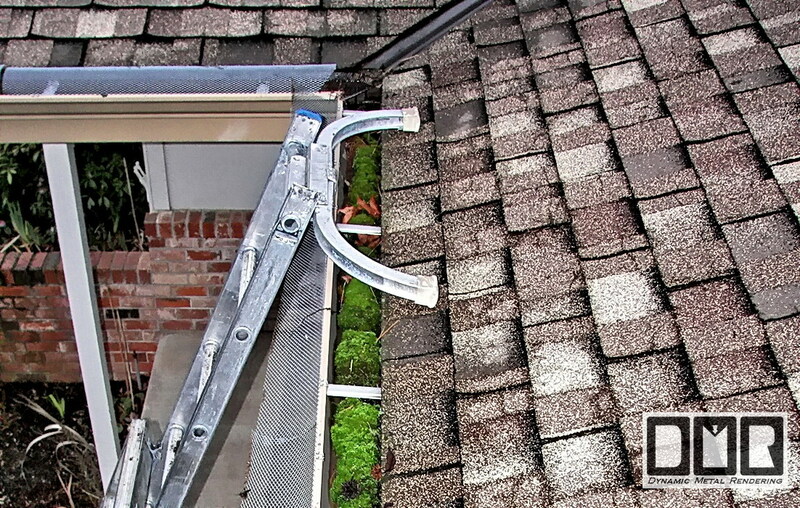 Proper installation is something we have rarely seen when removing old gutters. Believe it or not, most Gutter Contractors do not have their installers use a level to check their installation as they go. 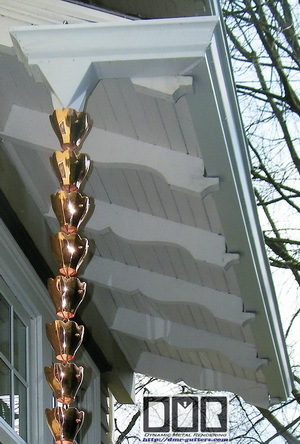 Below is a copper downspout from a side angle. To the right is a custom reducer mounted under the gutter with no elbows, as the downspout just runs down the wall. That application allows for an even larger outlet than the elbow below does, but there are not many applications for this use. This option in copper adds only $50 per outlet to the cost of a new copper gutter installation. 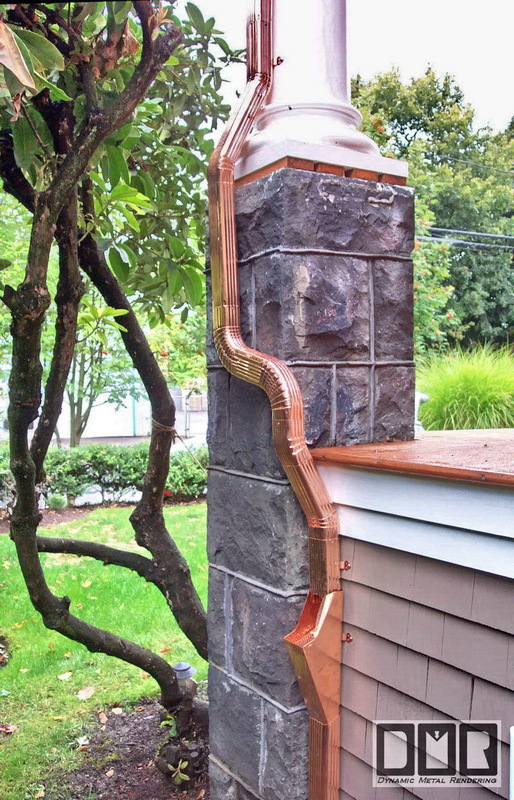 Or $75 to alter your existing copper gutters to these larger outlets, but as stated above, we are not able to offer the same sort of No-clog Warranty, since your old gutters would most likely not have been installed properly with a grade towards the outlets. How do we trust they work as well as you say? That is a very good question. I feel strongly that you will be quite happy with the results. Of course I would say they are the greatest thing since sliced cheese. I do not think highly of salesmen either. One thing that is different here is how I am not just a salesman. I am still an active gutter installer over the last 2 decades and have been using these since my first year in business. I am out there in the field in getting my hands dirty and cut up in one of the worst areas of the country for lots of rain, which grows big healthy trees, which as you well know creates lots of natural fallout debris on roofs. Gutters are not just an option in this area. They are required by building code to help reduce foundation erosion. I was inspired to make these for our gutter clients. Over the last 2 decades I have installed these on most of the gutter jobs I've done, as it is one of my most popular features I offer, and has more to do with the success of my gutter job sales than any other factor. I have made numerous alterations over the years to refine the design to solve any feedback and issues I have noticed. The only negative feedback I have gotten about these strainers is how there may be a little splattering of rain water from hbouncing off the debris left on the screen, but I figure that when it is raining hard enough to cause this issue, the ground all around it already getting soaked. It is still able to manage a good 95% of the water that passes. It is certainly a challenge to design the perfect device that has the best possible balance between cost, function, looks, strength, and longevity. Factors that would not naturally work in harmony with each other. If I were to make these catchers a lot wider and deeper they would work better and need less frequent servicing, but they would also look horrendous and cost a lot more as well. I recently switched to stronger stainless steel woven screen, from this copper expanded metal seen to the right, which I had used over the previous decade. I have seen several other faulty catcher designs. 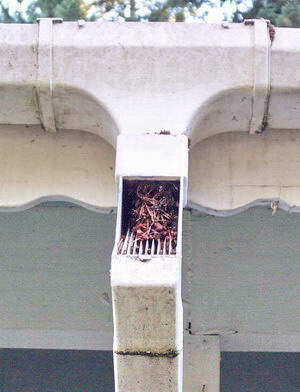 The best maintenance free device may be one that is closed unit that would activate an incinerator when the debris reached a certain volume using the DS pipe as the exhaust flue, but that would be quite expensive and complicated to install with all the wiring and natural gas piping needed. It also could pose a potential fire hazard. What about a removable screen/basket? As to the design of the Leaf-catchers we make; I have been asked if I could make a removable basket for easier less messy maintenance. A closed unit that has a pull out basket may look nice, but it causes more problems than it solves; out of sight, out of mind. Before it gets serviced the debris has often become impacted up the downspout above this strainer well over a foot and becomes very hard to clear out without removing the whole downspout. I have found that to not be very practical. Also, a removable screen basket will get damaged and even lost in some cases. In general the debris it catches is fairly fresh and had not been sitting in the gutter for all that long, which does not stink like it often does when cleaning out a gutter that had not been service in a while, so there is not the bacteria buildup in that fresh debris. It should not pose any health risk. You can always opt to wear plastic glove if you do not want to bother to rinse off your hands afterwards. 1. I do not have any custom machinery that I had tooled to mass produce that would make me stuck with this one design, like other companies. 2. 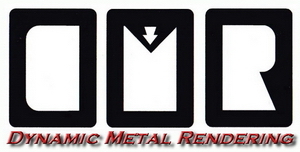 I have to draw these out on the sheet metal one at a time from a template I made. I cut out each Leaf-catcher one at a time. Not made by the thousands in advance, so I could alter the template as easily as drawing a new diagram w/o delay. 4. I've altered the template several times already, after testing each version out for several years each, while listening to my client's feedback. 5. I've been working with these since 1992, so it has been over 2 decade now of development and testing it's long term use. Why did you design these? We have a lot of pine trees with small needles in the Northwest here that will for the most part get through the screens we install over the gutters. We would estimate a good 60 to 70% of the smaller debris still get trapped in the finer weave screen in the Leaf-catcher unit's. We do not see how we could design one with a higher percentage without causing more problems than it helps. 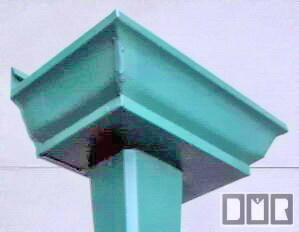 It is angled to allow for the debris to be pushed out of the open mouth design if it is neglected for too long. At $60 to $80 each installed, they are quite the bargain compared to the $75 to $100 an hour a plumber will charge you to clear out your storm drain pipes. These seem to catch even small debris pretty well as shown here, yet still let most of the water pass. If the screen had smaller holes it would plug up quickly and fail to allow water to pass through it. Larger holes would allow too much smaller debris to pass through of course, so this seems to be the best balance. How do we operate them? As you can see here they catch more than just leaves. 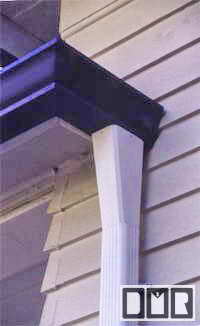 With these downspout strainers we make, there is no hinge or removable screen to lift up and dump out the debris. There is no moving parts. We could easily make the screen basket removable with this current design, but we go to an extra effort to crimp the baskets into the housing, making them not easily removable on purpose. If they were removable, the basket would inevitably get damaged, and it would also scratch up the inside of the housing putting them back in place. It has proven to be a simple task to reach in there with your fingers and extract the debris and simply toss it on the ground and wash your hands off just a few times a year. Or if you want to make this more sanitary you can carry a small bucket and use rubber gloves. That debris does not seem to get too nasty with smelly bacteria, as it often does when sitting for many months up in the gutter, since the moisture is not trapped under the debris. It dries out and has not been nearly as unpleasant as removing decomposed debris out of the gutters. How is the debris able to get down to these strainers? 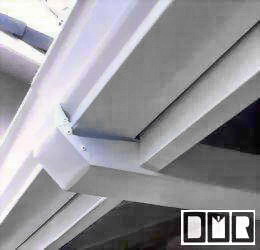 (a) As listed above how the gutters were installed will make a large difference as to how well this system will function. From our experience most installers do not bother to use level while installing new gutters, let alone angle them to have a slight grade towards the outlets, as we do on each job. (b) Also, what kind of downspouts you have will make a large difference. 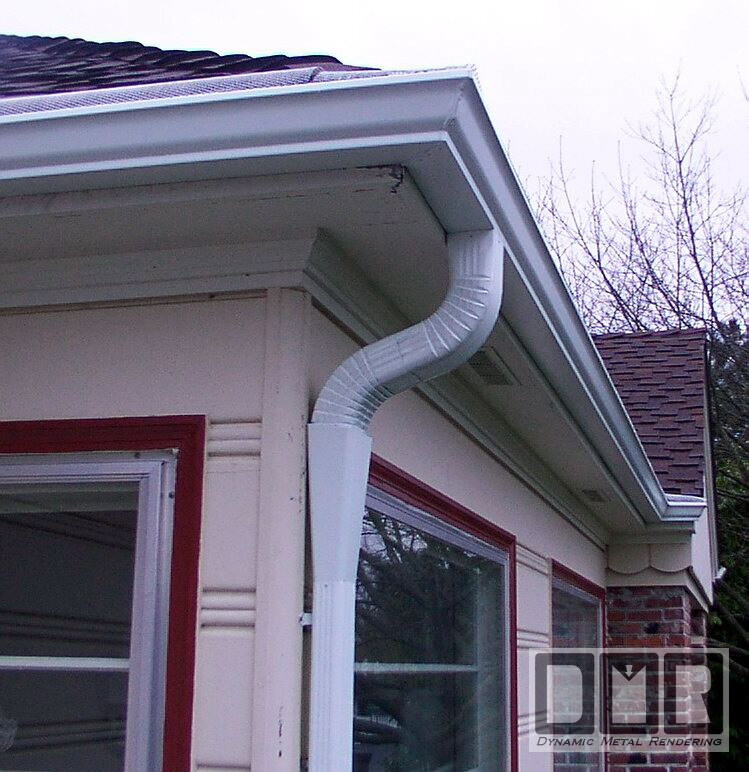 In this area it seems that most gutter contractors are too cheap to buy the curved elbows for the downspouts. They have their installers cut the straight downspout pipe and fold it to make these angles. 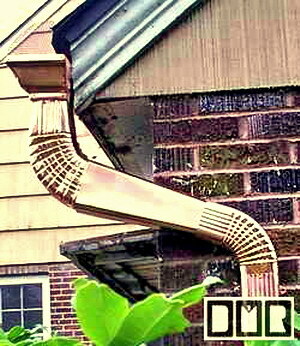 This is a terrible way to do it, causing frequent blockages and also makes for a noisy downspout. 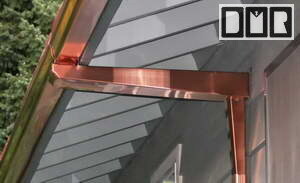 we even see it done that way on the most expensive Street of Dreams show homes with copper gutters. It is not even ignorance. All these contractors know they are cheating the client and it simply will fail. The problem is that it is not required to offer more than a 1 year warranty on all construction, so they are able to get away with it. (c) As stated above, the screens also help a lot to keep out the large debris, like the pine cones and branches, that will damn up and clog up a gutter quickly. Then in a heavy down pour there is a much greater chance of rinsing out the debris into the DS. (d) The larger outlets also make a marked advantage to the function of the gutters. It is the exact opposite of placing a strainer up inside the gutters. We have seen in many cases where the standard size outlets will jam up and cause a natural strainer in the gutter, where the debris decomposes turning to mud and not let water pass, so the gutter overflows. We are not trying to say we have a perfect solution, or that we will not be making more improvements in the future. It is tricky to work all these different details together for the best possible advantage. We hope that we are fortunate enough to come across information and ideas to improve it that much further. We are always open to good ideas. We have not seen a better device to handle this issue in an efficient manner at any price, let alone a reasonable price. We install them about hip height, so you do not have to bend over to clean it out. These Leaf-catchers cost $50 each to be installed with your new aluminum downspouts, or $75 to be installed in your existing downspouts. A little more for copper of course. If you are not local to us, you can still order these through this web site from our Shipping web page. You will also find detailed instructions how best to install these Leaf-catchers on your place, or have a local contractor do it for you. They were originally designed by a gent here in Portland Oregon several decades ago. He was a gutter contractor, and later retired. Then Gutterman's Supply copied his design. I was ordering 50 units at a time from them paying $3 extra per unit to have them use copper screens instead. They do not run a very professional operation there and I was having to wait over 3 month for them to get around to filling my order. I could not wait that long, so through my frustration I finally made up my own patterns and made some other improvements that I felt were needed. 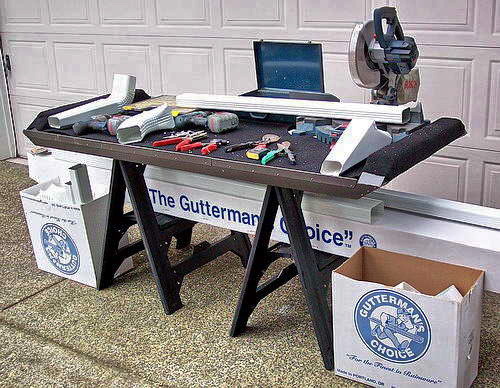 The few installers who buy the LCs made by Gutterman's Supply will install them close to the ground, right in the underground drainage pipe for simplicity. They also will not have a copper screen. From what we have seen those screens are broken through within the first year or two. The pounding of the water and debris is too much for those fragile screens. We have seen some with steel screens, but they will begin to rust within a few years. We noticed this problem before we began to install them, so I made sure Gutterman's Supply did not use the aluminum screens for the LC's I ordered. We feel we have the best design out there for this purpose. Stay away from the plastic strainers, because the sun will ruin them in short order. We also attach them to the wall with the better pipe cleats and stainless steel Philips screws, instead of the straps and nail like you most likely have on your house now. This makes it easily removable and reposition for cleaning or painting behind the downspouts. 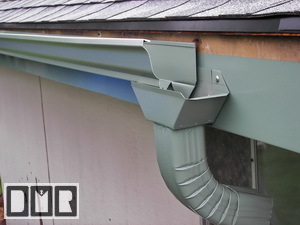 There are not a lot of similar options out there, but above is one solution made by the makers of plastic gutter parts. It was a good attempt, but as you see it still clogged and when it does work, it dumps gutter water and gunk on the head of people using the walk way under this contraption, and it's mounted too high up to reach in order to clear out the blockage. Not user-friendly. I just stopped in (7-19-04) to ask this little old lady if I could take these photos. She reports how she hates them and knows she needs new gutters. Sadly, we were booked too far out and she went with another contractor that was ready to do the replacement the very next day, but all she got was lousy steel gutters she's now stuck with. Here is another example of the over-sized outlet option. The above picture is an example of what is called an 'B' elbow. This is also a 'B' elbow. The double 'A' offset elbows shown here are used to go around that steel pipe vent going up the wall. We decided to take the water from the main gutter section, instead of punching a hole in the gutter near the end cap, so that the water and debris did not have to go around these two corners. It would have made the downspout a lot shorter, but the drainage would be much less effective. We stock 5 times as many elbow configurations than most of the other Contractors for a better fit to your house. Here are photos of the 3.5" x 10" wide custom Super Outlets with the larger 3" x 4" industrial size elbows mounted underneath and sealed to it. I make these for some jobs to help avoid gutters from clogging that much more or to catch the run-off from 2 separate gutters for the advantage of having an expansion joint to relieve the tension off the sealed corner connections. This adds another $50 to the cost in aluminum or $65 in copper. 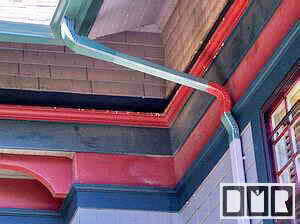 Rain-cups are used in leu of a regular downspout in an area where a straight gravity fall is possible. This outlet piece under the gutter helps to effectively funnel the rain water into the cups allowing for a larger outlet opening without restricting debris. This is the ultimate in a no-clog outlet design, but it is not an option I normally include in our bids, unless specifically asked for. This was the finished product from the wishes of a customer in West Linn Oregon. The customer had a 55 foot gutter, with a lot of pine trees above the roof. He was fed up with the constant grief he would get from the constant debris filling the gutters. He requested to have the gutter split in half and dump into a basin of some sort. Knowing that what he described would look terrible, and we would have nothing to attach the basin to, we came up with this one piece unit that is also part of the gutter it's self. We covered the top of the basin under the eaves with a screening to keep the critters out, but we left it able to open in the case it ever needed cleaning. It then goes into a 3"x 4" downspout pipe, which is twice the size of a normal downspout. It cost this clients in West Linn an extra $450 over 10 years ago, instead of only $50 like the over size outlets we normally install, so it may not be for every one, and does look a bit extreme. This is a custom aluminum catcher basin to catch the rain water from a different kind of narrow valley. It was made from a straight 3' gutter. Again, with each end mitered, instead of just slapping on a pair of end-caps. It has a 3.5" x 4.5" funnel mounted in the bottom as the outlet, reducing into a standard size downspout going straight down the corner of the house. The cost for this was calculated from the basic cost of the gutter needed to make this: $17.50 + the cost of mitering 3 corners: $120, + installing this funnel in the bottom: $50 = $187.50 total. 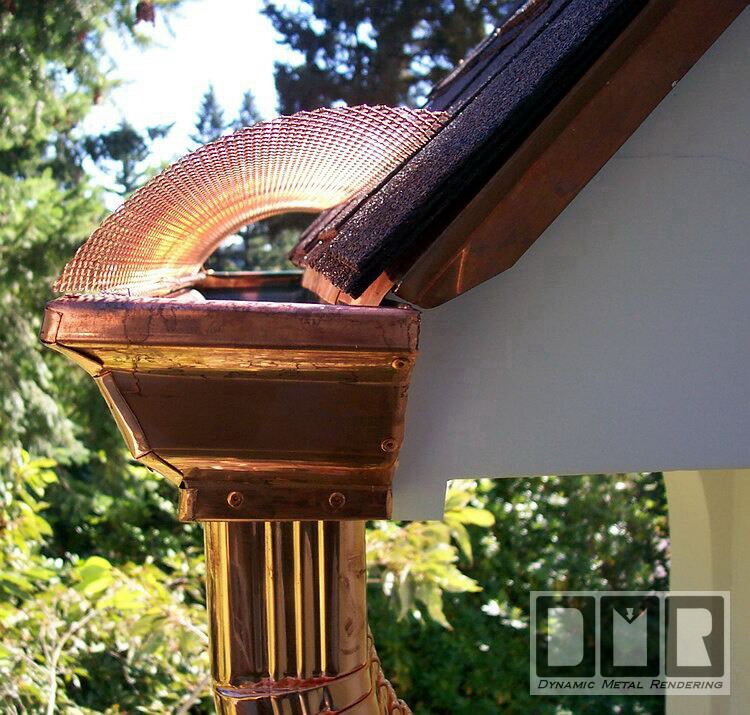 This was the finished custom product for the downspout feature for a gutter over the back deck on a house in South West Portland Oregon. As you can see from the glass sliding doorways how the gutter on the back deck was so low, it was just higher than a tall persons head. We came up with this one piece unit to keep the down spout up as high as possible, since the headroom clearance was at a minimum. We had to design it open at the top, since there is so little slope to it. It then goes into a custom 3.5"x 4.5" downspout reducer that funnels into a standard 2" x 3" downspout. 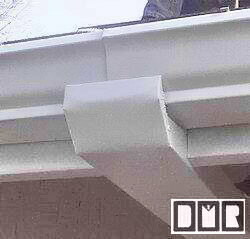 the picture below shows just one side of the gutter over lapping into the custom tray. 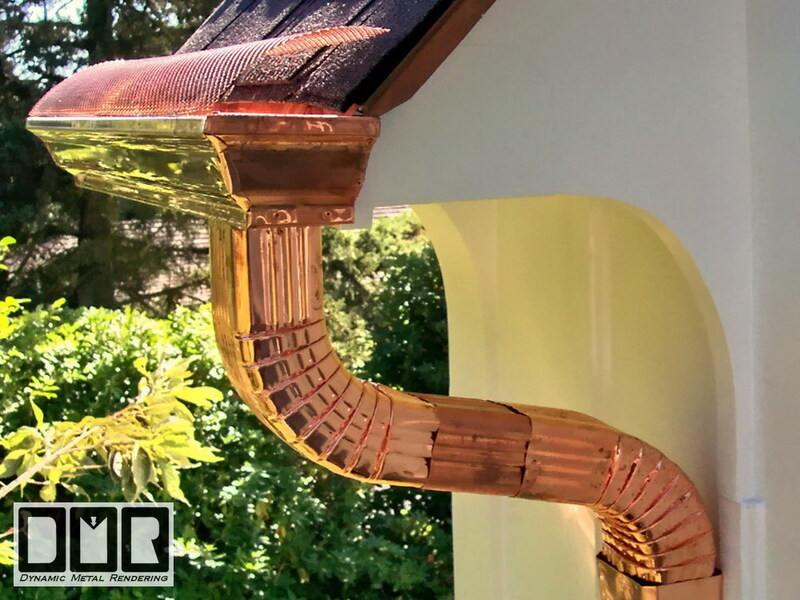 We charged about $150 extra for this custom scupper tray or $200 in copper, depending on the length of the eaves, instead of normal downspout cost. This is a custom aluminum catcher basin to catch the rain water from a narrow valley. It was made from a short straight gutter, with each end mitered, instead of just slapping on a pair of end-caps. We flattened the back side to make the bottom a bit wider and made a new higher back side. It has a 3.5" x 4.5" funnel mounted in the bottom as the outlet, reducing into a standard size downspout. 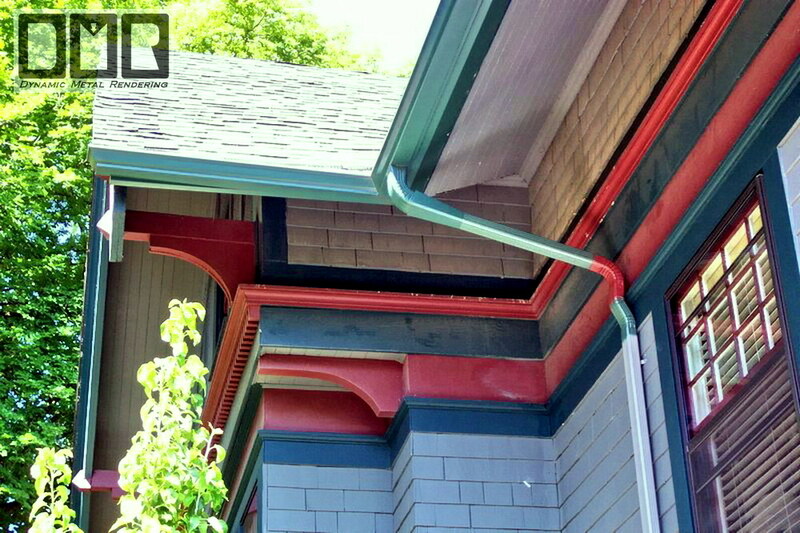 There is a double 'A' offset elbow right under it to divert the rain water back to the downspout on the siding. We didn't need to go to this trouble to miter the ends, but it just makes it look a little nicer, without going to too much trouble like the scuppers we custom make.